1000s of daily machine alerts managed. Easily capture, consolidate and prioritize DTCs, oil sampling results, preventative maintenance alerts, and more into one centralized and secure portal. Make “swipe and delete” email a thing of the past. Be proactive and manage machine health for customers before they’re aware of the issues. Build customer loyalty and create a sustainable competitive advantage. See your fleet in action and know exactly where all your machines are located. Never lose a machine again by viewing everything on a single map. Zoom in for closer examination or zoom out for a holistic picture. 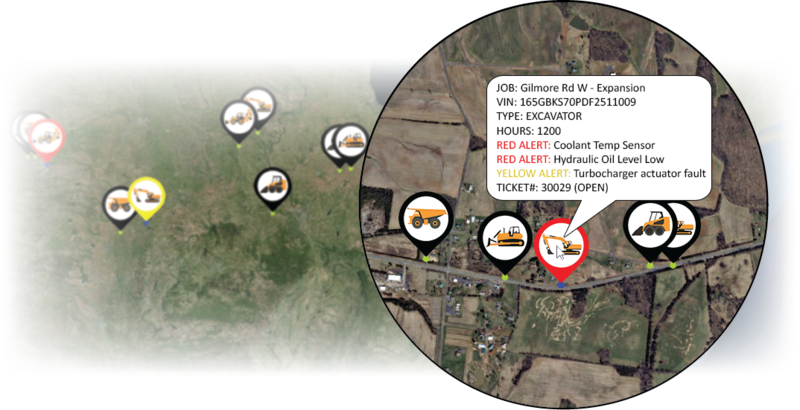 Monitor more than just the location by being able to quickly spot troubled machines at a glance with colored pins corresponding to alerts (i.e. red pin means red alert, high priority). Then simply hover over for detailed alert information and ticket status. Machines with open tickets are identified by a blue location dot. Leverage a comprehensive shared knowledgebase to reference, store and manage solutions, including labor and parts requirements. Diagnose machine troubles in minutes rather than hours. Allow your technicians to fix a more diverse population of machines. 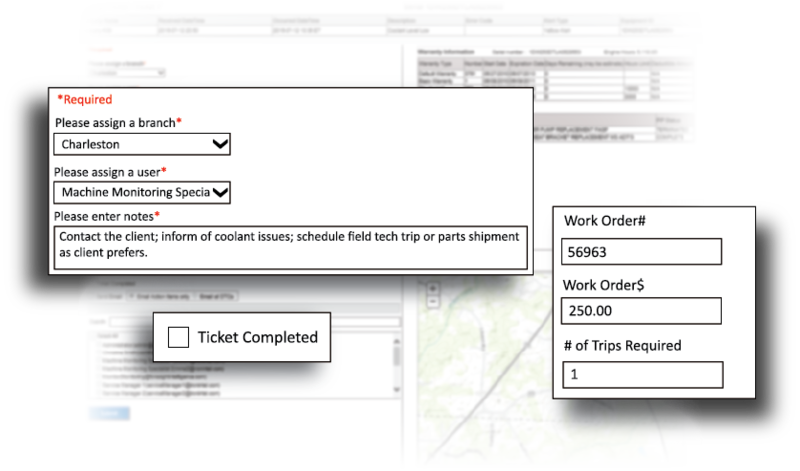 Combine multiple alerts with solutions into a single ticket for efficient work order dispatch and processing. Streamline the operations of your service team and fix more machines in a single trip by having the right parts. Advanced analytics make it possible to thoroughly monitor and understand machine health. 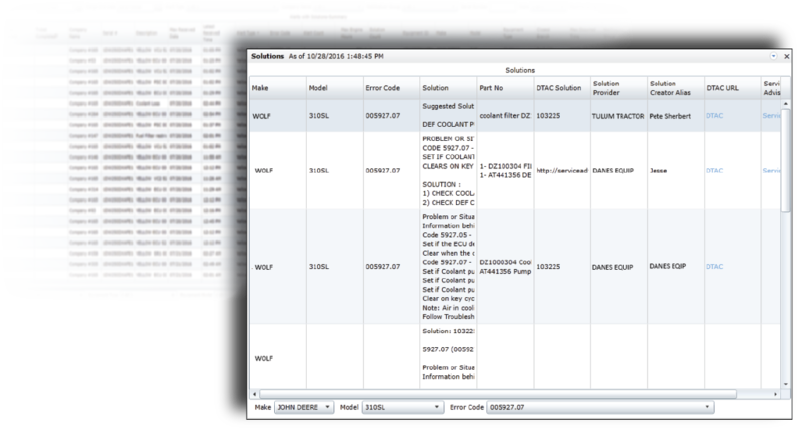 Uncover trends such as when a specific type of machine typically fails or what type of problems are common among machine populations. Ensure visibility and accountability among your workforce. 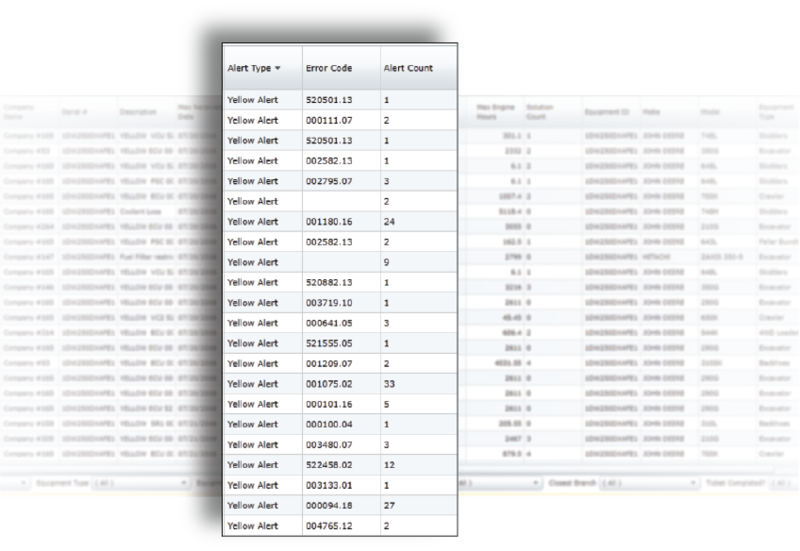 Track individual and branch performance from ticket statistics. Easily identify successful activities and areas for improvement based on real-time data. Don’t miss an opportunity for revenue by using data to make smarter and better business decisions. "The folks at Foresight Intelligence have been great to work with. They quickly respond to our needs and open to feedback. I am excited about this new partnership and look forward to future opportunities with Foresight." Dean NoltAssistant Product Support Manager, Plasterer Equipment Company, Inc.
"WOW! This is exactly what we were looking for! You made my life so much easier!" "I want to say that I am very impressed that Foresight is not satisfied with resting on their laurels. They continuously work to improve their products." "It has been a pleasure working with a crew that wants the IATC to work as much as I do. I look forward to working with the Foresight team in the future." "IATC has definitely helped streamline our alert monitoring process and has made us more efficient. IATC has given us one portal to monitor and distribute alerts as well as access a host of other diagnostic and machine information that’s helped us to respond quicker to our customer’s needs and create accountability at the branch level." VP Operations at Foresight Intelligence, Inc.